LinkedIn is launching an expanded version of its Marketing Solutions platform today. There are new products, an expansion beyond Linkedin Itself, and a broader vision for helping advertisers reach potential customers throughout the sales cycle. The platform now has five main pieces — LinkedIn Lead Accelerator, Sponsored Updates, LinkedIn Onsite Display, LinkedIn Network Display, and Sponsored InMail. Lead Accelerator is the big product launch, allowing businesses to divide their audiences into different segments, and then to deliver ads and content in the right sequence, targeted to each group. Russell Glass, the head of products for LinkedIn Marketing Solutions, told me this builds on products that were part of LinkedIn’s acquisition of Bizo, particularly its Multi-Channel Nurturing Product. Among early testers of the Lead Accelerator, eCornell says it doubled its landing page conversion rates, Localytics’ lead conversion rate increased by 50 percent, and Lenovo’s cost per lead fell by 60 percent. LinkedIn is also announcing a new Display Network that allows advertisers to run ads on both LinkedIn itself and on 2,500 publisher sites across the web. When I brought up the fact that Facebook and Twitter have also been working to give businesses the ability to advertise across websites and apps, Glass said it’s “fair” to suggest that LinkedIn is on a parallel path, “but for the professional world.” That professional context makes a big difference, he added. 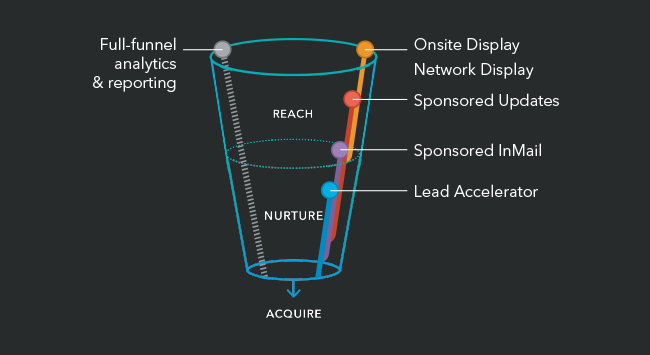 That, he argued, is why it’s important that the Marketing Solutions platform can “nurture people along that sales cycle.” Glass suggested that with the new products, LinkedIn can now address the full sales funnel, first attracting customers with On Site Display and Network Display ads, moving them down the funnel with Sponsored Updates and Sponsored InMail, and helping with the final stages of customer acquisition through the Lead Accelerator. It’s worth noting that while Talent Solutions remain the biggest part of LinkedIn’s business, Marketing Solutions revenue was up 56 percent year-over-year in the company’s most recent earnings report, growing to $153 million. You can read more about the new offerings in Glass’ blog post.